One of the most important of winter vegetables, the parsnip gives a heavy yield in return for a sunny position in well-dug ground. The fat, tasty root likes to go to a good depth; but excellent crops can be got from shallow soil if the right varieties are chosen. Where there is not much depth of good soil the most suitable kinds are Turnip-rooted (small, round roots) and Intermediate (midway between the round and the long-rooted varieties). Where there is a good depth, sow the long-rooted Tender and True, Hollow Crown, Student, Maltese, Jersey Marrow. A ounces of seed is sufficient to sow about 75 ft. of row. Seedlings appear in from four to six weeks. Roots are ready for lifting (as required) in November and are available until March. If a row can be located where onions, leeks, celery, beans or peas did well as the immediately previous crop (thanks to deep digging and generous treatment) the parsnip is well provided for. Otherwise the piece of ground should be dug 18 in. deep (if the subsoil is of such a nature as to allow this) and enriched with really old manure or well-decayed leaves and other greenstuff placed mostly below the top 9 in. Where the subsoil is chalk, clay, gravel or other obstinate material, dig to whatever depth is possible and sow the varieties previously named as best for this type of ground. A generous dressing of wood ash, or 1 1 ounce sulphate of potash to the square yard, forked or raked into the surface a few days before sowing, is advisable in all cases. When and How to Sow. Because of slow germination, and slow early growth of the seedlings when up, seed needs to be sown as early in the year as possible; if not in February then in March. But the weather must be waited on, and the soil be in such a condition that by vigorous forking or raking the surface can be broken down as crumbly as can be; for the seed requires to be covered with fine soil. Wood ash worked plentifully into the top, and a good drying wind, will help bring it into suitable condition. Inch-deep drills 15 in. apart are made with the hoe, where the plants are to remain, and distribution therein of the confetti-like, seed calls for a calm day; a wind may blow most of it away before it can touch the drill bottom. Five or six seeds are dropped together, to form groups, at 12-in. intervals, and the soil pushed back into the drill above them. When the seedlings are about 2 in. high each group is to be reduced to a single plant. The surplus should be drawn out carefully so that those remaining are left firm in die ground. Growers wanting very long parsnips, for exhibition purposes, sometimes adopt a special method of soil preparation. Holes are made, 15 in. apart each way, with an iron bar or stout pointed stake driven into the ground to the depth of about 3 ft. The bar or stake is worked to and fro until the hole is about 8 in. across the top and tapering to the bottom. Each hole is then filled with good sifted soil, made fairly firm to within 1 in. of the top. Five or six seeds are sown on each prepared surface, and the resultant seedlings of each group thinned to one. Roots thus have an unrestricted run down with every inducement to swell. The method is specially useful in hard clay, or where there is chalk or other obstructions. But the roots produced, though usually broad-shouldered, have a considerable length of whip-lash end which is mere waste so far as cooking purposes are concerned. From the food view-point, medium-sized parsnips are the best. Regular hoeing along both sides of a row not only keeps down weeds but maintains a crumbled surface which, by preventing undue evaporation of moisture from the ground, reduces the need for watering in very dry weather. During the hoeing the roots will be helped to increase their bulk if superphosphate is worked in, 1 ounce per yard run of row. Two applications are sufficient – the first about a mondi after thinning out, the second about six weeks later. Too many stones in the soil cause roots to become misshapen, and lower ends of long-rooted varieties will fork and turn up in shallow ground. Forking also results from the digging in of fresh animal manure. Grubs of a small fly sometimes tunnel through the inner tissue (between the back and the front) of leaves. Their progress is visible externally in the form of light-coloured trails. The grubs feed on the inner tissue and their activities result in undersized roots. Methods of dealing with these, and with grubs that attack the roots, are explained in the chart ‘Remedies Against Enemies of Vegetable Crops’. Parsnips retain their full flavour when left in the ground as long as possible and lifted only as required. Roots should be got up with the spade in such a manner that there is no danger of these being broken in the process. The easiest and surest method is to dig an 18-in. 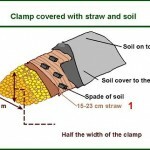 deep hole at one end of a row and work the soil away from the first root until this is exposed full depth. It can then be loosened and, gripped by the crown or shoulder, drawn out. Subsequent roots are got at by working the soil back into the hole or small trench thus left by removal of the root that was last extracted. Roots can be left in the ground until February, when growth starts again. At first sign of that happening the remainder should be lifted and put into store. Meanwhile, when frost threatens to set the ground too hard for roots to be dug up for current use, a layer of bracken or straw scattered over the undug row will prevent them from being frozen in. Alternatively, roots may be lifted in bulk, after November, and stored. This is always advisable if the ground lies wet in winter. Lifted, the top growth is cut off and the roots are allowed a day or two to dry (under cover, if necessary). They are then stacked in a heap in a cellar or dry shed; with a sack or old bits of carpet thrown over them if the shed is not too weatherproof. They should not be shot out of a wheelbarrow but stacked neatly, to conserve space and prevent injury. The best way is to pack them head to tail (Fig- 173). If under-cover storage space cannot be provided parsnips are safe enough outdoors clamped as described under beet. Check Out These Articles Too!